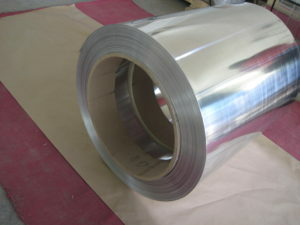 7075 aluminum alloy strip is not only applied in daily life but start to be applied in transpiration area with the development of technology, such as aerospace structural materials, and now it also enter into the field of auto development. Aluminum strip technology development become the trend of the times. Though foundry technology is the usual method of aluminum strip processing, it is no longer meet the needs of the preparation of high performance aluminum alloy strip . Firstly, the traditional process is difficult to further improve the strength, plasticity, rigidity, heat resistance and corrosion resistance. Secondly, in the process of pursuing for high performance, the foundry technology cost increased rapidly along with the new equipment and finished products, Thirdly, due to the increasing content of alloy, plasticity is often reduced, and the subsequent pressure processing costs, yield reduction. In the field of industrial materials, Industrial profiles are often technical difficulty is big, also of high value-added products.From the point of application field, the construction industry is still the main field of aluminum profile application, far more than other areas, consumption increases year by year, by 2009 more than 63% of the total consumption.With the improvement of level of economic development and industrial technology, aluminum consumption has great potential in the field of industry.In the next 10 years, the proportion of industrial aluminum extrusions total consumption will be close to 70%. Therefore, the high cost of production greatly increased the use of advanced aluminum alloy bar, seriously influenced the development of the overall market size. In these areas, the injection forming technology has the dual advantages of performance and comprehensive cost, can make the advanced using threshold of 7075 aluminum alloy strip is reduced, still can further improve performance, in a certain range to achieve to generation of steel, aluminum and cultivate advanced aluminum alloy market rapidly, and, in turn, promote the scale of spray forming technology for the cost advantage. Therefore, the injection forming technology will become the main advanced aluminum alloy production process. Aluminum alloy foundry technology is of far significance and influence to the development of 7075 aluminum alloy strip . In order to make 7075 aluminum alloy strip market rising steadily, we should improve foundry technology to a high stage. Every step in the process of ascension is irreplaceable significance to the whole process.